Slash ft Myles Kennedy & The Conspirators have released a stream of their brand new single titled Mind Your Manners. 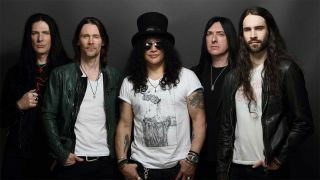 It’s the latest track taken from their upcoming album Living The Dream, which is set to arrive on September 21 via Slash's own label Snakepit Records and Roadrunner Records. The group previously revealed Driving Rain from the follow-up to 2014’s World On Fire. Kennedy adds: “Mind Your Manners was something I didn’t hear until the guys had started jamming together. It’s a cool, up-tempo sort of thing and I knew immediately it would have its own place on this record. Slash ft Myles Kennedy & The Conspirators have also announced that they’ll play an extra show at The Palladium in Los Angeles on October 16. They’ll head out on the road from September 13. Slash is the cover star of the upcoming issue of Classic Rock magazine, which will go on sale from August 21.